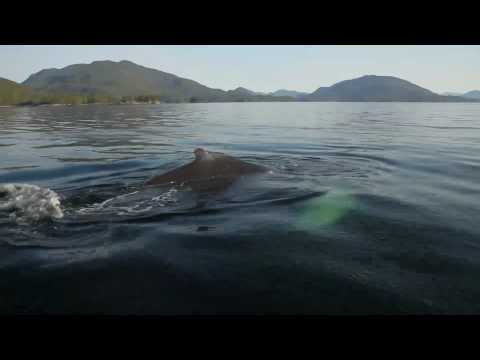 You must see this eye-popping footage of a recent rare close encounter with a humpback whale off the coast of BC's spectacular Great Bear Rainforest. Whales like this one and many other coastal species are at grave risk from Enbridge's proposed pipeline to pump oil from the Tar Sands across BC and into supertankers in Kitimat, before plying some of the world's most treacherous waters en route to Asia. This awesome creature approached a boat carrying among others filmmaker Damien Gillis, and proceeded to interact playfully with the crew for 45 minutes! Watch highlights of this amazing and unique west coast experience - caught on camera. And stay tuned for a new documentary for Pacific Wild by Damien Gillis on the proposed Enbridge pipeline and coastal tankers, coming soon to PacificWild.org and TheCanadian.org! Of what we are fighting for. Keep it coming! that's impressive!!! thanks for posting this, made my day. Thank you for posting such a great video and adding the important information that all people need to be aware of. Has be so inspired I am considering coming up north to these meetings. Rally to protect our coast! Come out to a rally to stop Enbridge's proposed pipeline!